The Mermaid's Tale: What makes our language abilities unique? Or are they? What makes our language abilities unique? Or are they? Anthropologists have long assumed that the more we understand of non-human primates, our closest relatives, the more we'll understand ourselves. Anthropologists have spent untold hours observing chimps, gorillas, lemurs, baboons, and other primates in the expectation that what they'll learn will allow them to decouple nature from nurture, genetic from cultural influences on how we behave, as well as elucidate what it is about us that makes us unique: our upright posture, the size of our brains, our opposable thumbs, our language ability? Traditional reasoning has it that tool use and abstract symbolism made our social and material world different from and superior to in a competitive sense, other species in Africa. Symboling came to involve verbal communication--language--in the way we do, that has largely been assumed to be unique and to have evolved as unique out of rudiments present, at most, in close ape relatives. But it seems that more distant relatives can be informative as well. In fact birds have more in common with our language abilities than do our nearer relatives in that we all, unlike our primate relatives, have auditory-vocal learning abilities. That is, we can hear something and repeat it. A paper in the July 2011 Nature Neuroscience, nicely summarized in Cosmos here (which, for unremembered reasons, just came up in our Twitter feed which, by definition, makes it current, right? 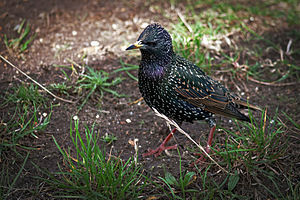 ), looks at the language of songbirds to address the question of what is unique about human language. Recursion enables language to become an infinite system. Because clauses (e.g. "Holmes studied the footprint") can always be embedded in the next clause (e.g. "Watson said that Holmes studied the footprint") which can then be returned for the next combination (e.g. "I read that Watson said that Holmes studied the footprint"), the set of sentences and clauses that can be generated is technically infinite. The three scientists claimed that complex, recursive syntax cannot be learned by humans or other animals, but that we must have a unique, innate specialisation for recursion and, by extension, complex syntax. 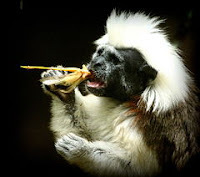 Fitch and Hauser followed this up with a 2004 study of cotton-top tamarins showing that they weren't able to learn recursive patterns after listening to human speech. Then, in 2006 Timothy Gentner et al. suggested that starlings could understand recursive song, but only within pre-set structures (nicely described here, with the added plus of audio of starling songs). This paper was challenged, however, the data said to have been wrongly interpreted. So, back to the starting line. And then along came Abe and Watanabe to say that songbirds really can do recursion. We analyzed their spontaneous discrimination of auditory stimuli and found that the Bengalese finch (Lonchura striata var. domestica) can use the syntactical information processing of syllables to discriminate songs. These finches were also able to acquire artificial grammatical rules from synthesized syllable strings and to discriminate novel auditory information according to them. We found that a specific brain region was involved in such discrimination and that this ability was acquired postnatally through the encounter with various conspecific songs. Our results indicate that passerine songbirds spontaneously acquire the ability to process hierarchical structures, an ability that was previously supposed to be specific to humans. A similar challenge has been made to this study, however, as to the 2006 Gentner et al. study, namely that there are alternative explanations for how these birds discriminate sound. And anyway, what happens in the songbird brain is different from what happens in the human brain when these sounds are processed. But as with many many biological traits, there can be many pathways to the same trait, whether it is a morphological or a behavioral one, so the idea that only when the neural/functional pathway is the same can we say that songbirds and humans have the same language abilities is patently a non-starter. If songbirds can do it, they can do it however they get there. There is a lot going on in this debate, and though it's not our area, just from reading the papers and reports about the papers it seems that people are taking sides, digging in their heels and having a hard time agreeing on what constitutes evidence and falsification. But, as with all human traits, our language ability did not evolve from whole cloth. It has its origins in earlier traits, many of which we share with other lineages. And it's complex and involves our complex ability to speak, our brain's complex ability to let us speak and to process sound and abstract ideas, as well as our open-ended ability to learn. And there's that window of opportunity in young children that allows language to develop more easily than when we're older (which is why Gentner chose next to study young starlings). We may not have much in common with birds in terms of how we produce sound or the structures of our brains that process it, and indeed we're much closer to non-human primates in that, but this may be insignificant. If it's true that songbirds do have a sort of recursive language, as we do, it may well have evolved separately from our own ability; an example of a kind of convergent evolution. But what this whole story means to us is that the idea that a single trait can be plucked from the highly complex mix of traits that is language, which involves so many different parts of our anatomy and our brain, and can be used to define what it is that makes our language abilities unique is, to us, not a very useful one. And, if it's possible to contest the uniqueness of any trait that is said to be the one that makes our language special, this is a good indication that it's not a single trait at all, but a whole suite of things that, added up, give us the ability to argue about this at all. This in no way minimizes the interest or importance of understanding how symboling and language have characterized or shaped our species during its evolution, nor of the complex neural mechanisms that must be involved. But it does show that it may be the trait, and not some particular mechanism, that is what is important, and that we should examine language on its own terms--in whatever species--rather than be too careless in human exceptionalism. I have two pet starlings and they are very good at taking sentences they've learned from me and rearranging them in ways that make sense. For example, "Are you ok?" and "Come with me" became "Are you with me?" When they say "Are you with me?" their vocal inflection is like a question, even though I've never said the sentence "Are you with me?" to them. This seems to indicate they know a sentence that starts with "Are you" should be inflected like a question even if they change the words. When they say "Come with me" they don't say it like a question. I say "You're a good birdie" and "You're a sweet birdie". They say those things and also "You're a good sweet birdie" and "You're a good Attila". That seems to show that they know "Attila" (one of their names) and "birdie" are both nouns, or both refer to themselves, or something. Does it also mean they know "good" and "sweet" are both adjectives? Interesting, isn't it?